It looks like Clipper is becoming a big hit with word going around that many retailers and even the SFMTA customer service office ran out of the fare cards. It's a normal expectation for many places to run out upon its debut or a big change in policy, similar to the Washington D.C.'s regional card known as the SmarTrip, ran short when certain agencies changed their policies requiring the card vs. a paper ticket or paying cash for parking. Last minute update: Clipper cards to be distributed TODAY (4/18/10) at Powell station from 4-7PM. With this surge of popularity and the fear of transit paper passes being kicked to the curb, I know the folks at the MTC and Clipper are working their butts off on projects to make the experience better. One big project I've mentioned before is modifying BART's ticketing machines to also add value to Clipper cards, and that is 43 new locations (in other words, hundreds of automated machines). While there is no set date, it is expected this or next year. We could use more add value locations in areas near major transfer points and bus terminal stops. For example, 33rd and Geary in San Francisco is a transfer hub for Muni's 1, 1AX, 18, 38, 38AX, and 38L. A perfect retailer to do the add value would be Quickly on the southwest corner, or the coffee shop on the northwest corner. SF State could really use some add value machines since much of the campus population uses transit. The Muni metro platform at AT&T Park would be a great location to install card readers at the platform entrances to make it easier for ballgame fans heading home to tag their card instead of begging people to move away from the reader on a sardine packed train. "Clipper only" express gates would be great for certain BART stations to help speed passengers in and out of the station. Can the BART gates make a pleasant confirmation tone sound that the card was accepted? View this video of a fare gate in Japan that gives a confirmation tone. The BART gates have an interesting problem. If a cardholder tags their card and it's rejected, the card reader is deactivated for about five seconds before the green light is re-lit and returns to 'ready' status. The card sensor also is temporarily turned-off in the event a paper ticket passenger has insufficient value on their ticket; I've had this happen where the person in front of me with a rejected paper ticket had to move away from the gate, but I could not tag until that green light turned back on. This might be a long shot, but worth a shot: Hong Kong made different variations of their Octopus card for their customers, like a key chain size one, watches, and even wristbands for kids. Is it possible for Clipper customers to get more unique items than just the standard card, even if they are willing to pay more for it? Is it possible for the readers to also accept fare payment through those credit/debit cards with the RFID feature (e.g. MasterCard PayPass)? 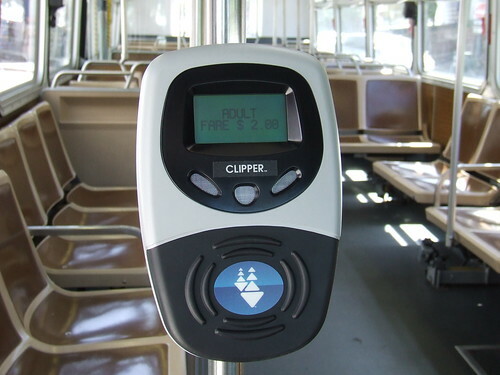 In order for the program to be successful, the card readers must be installed on all vehicles; with regards to this, why do some of the F-Market streetcars don't accept Clipper? The PCC and Milan (a high majority of the fleet) accepts the card, but the rare cars that usually only run along the Embarcadero like the boat car, "desire," and Melbourne don't have the equipment. That's all I can think of at this moment. If you have any wish list items, just send a comment. Great idea! I'd wish we could order custom cards with our own images on it. The number one priority has got to be the 72 hour delay when using the internet to add value to a card. It's not just inconvenient but really really annoying. I can purchase something from amazon and the charge appears on my credit card or bank statement in just a couple of minutes. Maybe an iPhone app where you can check your balance and add value? It may be too difficult to do but maybe the app can also inform the user that the bus arriving has a broken reader. One little program with at app idea, the balance won't be 100% correct. If I rode the bus and it took away $2, that won't reflect online for about 24 hours. It's part of the technological limits of the program, but it's the same with most other agencies. Without the risk of being charged another fare, is it possible to check whether or not my transfer has expired? Lets say I'm on Park Presideo and I need to get to 25th, a walkable distance, but there is a 38 approaching. If I have a paper transfer and if it is expired, I can choose to walk. If I have clipper, is it possible to board, scan the card, and see if the transfer has expired and then decided to walk or ride? $2 would be a steep price to pay to ride two stops. If it's expired, you will be charged a $2 fare when you use the card. The driver can't reverse the charge. I'd suggest a stopwatch. With regard to the transfer - It would be nice if you tag your card on a MUNI vehicle or any Translink/Clipper BART/MUNI add-fare machine and it display how much time you have remaining on the transfer. These simple transfer display terminals could and should be displayed at major transfer points or major intersections. New York is starting to launch their own smart card program for the MTA Subway and Bus. Instead of issuing an entirely new card altogether, they are teaming up with JP Morgan/Chase Bank Mastercard PayPass to allow debit transactions using a bank-issued card. This means the transit agency does not have to spend money on issuing new cards and can integrate it into an already existing system. Visa PayPass will become the next to join. I'm hoping for AmEx ExpressPay in the future, although there hasn't been an official announcement. I haven't used a new Clipper Card yet. I'm hoping that the time to read the card reduces down to a quick tap. TransLink of the numerous smart cards (Suica/ICoCa, Octopus, NaviGo, Oyster, CharlieCard) I have was the slowest to read. I'm always impressed when visiting Japan seeing people pass through the faregates. The transit agencies leave them open (they close if an invalid ticket is presented) and people literally stream through the gates without breaking their stride. I definitely agree that more add-value machines or locations at retail stores are needed. I'm also hoping for AmEx to be accepted (that's why I go to Walgreens to add value). Every time I return to the Bay Area from New York, I'm always disappointed that I can't use AmEx in add-value machines. So even if I am still on board I cannot check if the transfer has expired without the risk of being charged another $2 fare? I've had the transfers expire in the time it took me to get from Embarcadero to outer sunset on more than one occasion. The N is just that slow and the 30-40 min waits trains don't help. The whole pay to wait on the platform while your POP transfer wastes away is a horrible system. Safeway is closer, but closer still is the Ace Pharmacy where I used to purchase M passes. Ace never has line inside either -- cannot say the same about Walgreens. I only purchase Jan and May to Aug passes and now usually only through my employer because of the tax benefits. Do you know if Walgreen takes commuter checks? That may be the way I have go if there are no more paper M passes. I agree, trekking from one side of the city to the other on Muni is notoriously slow, it takes at least 45 minutes to get from one end to the other on the 38L. Maybe they'll make an incentive to let more people ride by extending the e-transfer policy to two hours (cough... good luck SFMTA Board on that idea). If you have Commuter Check vouchers, yes, you can claim them at Walgreens locations for e-cash, passes, or tickets. But there is a reprieve as the "M" pass won't go Clipper only until Spring 2011. The N Judah is significantly slower. I've boarded inbound N at Sunset Blvd before at 630am and at 730am, it still hasn't entered the tunnel towards Van Ness yet. I have no problem with the M pass not going Clipper. I much prefer the paper to the electronic card. I haven't tried Clipper yet - only used the green Translink card for about two weeks using ecash. The paper pass is much more efficient. I sometimes take the 16X at 5th St and about 60 people can board in about two minutes because only one or two people pay cash fare. Everyone else has fast pass. In the time it took me to scan my Translink, usually two, sometimes three people, already went around me. And then there is the issue of the POP police...it takes them significantly longer to validate a Translink card than a paper transfer or pass. So far I've only used e-cash because I felt it wasn't reliable enough for me to put a M pass on the Translink card. Two times the driver made me pay cash fare when Translink didn't work but other drivers let me go through regardless -- but by this time everyone already boarded and the bus was leaving the stop already. I would be more upset if I had a M pass since I'd essentially be paying double in some situations. Why don't the Clipper people advertise on the local ethnic media( TV, print, radio ). With such a diverse population in SF, many don't rely on the English media. To reach these residents, MUNI need market the Clipper on the local ethnic media. To date, I have not seen one Clipper ad in my native language. Just giving people free card in subway station is not marketing. Lot of people are not aware of the Clipper card. MUNI is missing out on a built in customer base. Many SF residents originally from oversea already experience a similar system like CLipper in their former country. I can definitely see the appeal of using the Clipper Card so as not to have to worry about correct change, etc. but the electronic version of transfers I find not at all appealing. I don't think any of the paper transfers I've ever gotten have been just for 90 minutes...most are for three hours or so. I have also been given late night transfers as early as 6:30pm and by 7:30 almost all buses give late night transfers. The electronic card being able to cut you off at exactly 90 minutes is going to be frustrating especially as has been pointed out that you have no way of checking if your transfer is still valid or not without tagging on bus and being charged if it no longer is valid. Kinda dumb if you ask me....I think I will be using mine simply as an emergency card when I don't have exact change. 1) different sound for pass vs ecash so i know when i've been mis-charged with ecash. 2) better displays. black on green was only okay 20 years ago for the Nintendo gameboy. VTA mounts the unit so low it's at my knees, so use green on black for unusual modes like express fare so i know when the unit is in the wrong more. 3) different bad sounds for couldn't read card vs account issues. makes issue more obvious when riders or driver helps a new user, and would help make it harder to do fare evasion by having a zero balance card and acting like it's a reader issue. 4) not so loud! the volume on Seattle's Orca system is much nicer. 5) ability to prohibit some tranit agencies from using my ecash. would help avoid inproper charges on agencies I have a pass for. 6) be able to buy bart high value ticket with ecash. my employers autoloads $35 a month so i can't buy one outright but could save up for one.